Keep taking your home practice further with the Intermediate Course – an extensive and growing collection of intermediate online Iyengar yoga classes. A brand new class is added to the program every week, which means you can always find new areas to explore. Challenge yourself to complete all of the classes and feel your practice grow. Do as many different classes as possible to ensure that you keep your practice balanced and expanding in all directions. Use the Course Content table to keep track of the lessons you have completed. The Yoga Selection Intermediate Course is the largest and most comprehensive library of intermediate Iyengar classes available online. You won’t have to worry about your home practice getting stale or stuck again. Do your practice where and when it suits you, with expert guidance. The Intermediate Course ensures you will be supported just as you would be in a yoga studio. The broad range of classes cover key areas of Iyengar yoga at the intermediate level. You can complete them in any order you like. Completing as many classes as possible means that you can work in an ongoing way towards a diverse and balanced practice. This course will help you to eventually progress to the advanced level. In general, once you have about two years of yoga experience in total you will be ready to try the advanced classes. Focus: This class guides you through a simple standing pose sequence using wall ropes. It is the first in a series of classes that will utilise wall ropes, and help you to incorporate them into a home yoga practice. This particular class includes some commonly practiced Iyengar Yoga rope variations. It shows methods for adjusting the basic set up according to your particular height and level of mobility, and includes ways of ensuring safety when practicing with ropes. The class will be an ideal introduction if you are newer to this way of practicing and does not include any complicated hanging inversions. Rope yoga can open numerous possibilities in your practice. It can be a way of accessing some of the more advanced therapeutic aspects of yoga, but it also can simply add an element of fun and lightness to a home practice. Key Poses: Utthita hasta padangusthasana I & II, trikonasana, parsvakonasana, ardha chandrasana, virabhadrasana I, parsvottanasana..
Equipment: Mat, chair, blanket, 2 blocks, belt. Focus:This weeks intermediate class follows a sequence of poses that systematically focus on the main muscles that are involved in jogging. This brand new video is an update of one of our more popular earlier classes. Regular stretching is an important way to improve muscle health and joint mobility. It can help to prevent injuries and combat the stiffness that can result from long-term running. The Iyengar method has a strong emphasis on precision and correct alignment. It has numerous therapeutic applications, and is easily adapted to a wide range of bodies, ages and personalities. Using a more in-depth and structured approach to muscle release after jogging can help you to feel more balanced. This sequence will also help to introduce you to some of the basic principles and defining characteristics of Iyengar yoga. Key Poses: Utthita hasta padangusthasana I & II, eka pada rajakapotasana I & II. Focus: This class focuses exclusively on sirsasana (headstand) and sarvangasana (shoulderstand). It covers the basics and fundamentals that will help you to more confidently practice these key inversions. Strengthening preparatory poses are also included that will suit students who are newer to these poses. These same poses will also suit more experienced students looking to build strength and stability. Sirsasana is eventually practiced in the corner of a room. This approach is particularly well suited to home yoga practitioners as it can highlight asymmetry that would otherwise only be seen from the outside. It can also be a containing support for students who are fearful of falling in a sideways direction. Chatushpadasana is used as a preparatory pose leading towards sarvangasana. This pose helps to teach the necessary upper back action that can bring improved lift and lightness to your shoulderstand. Intermediate Class 112 can be practiced as a stand alone class, or can be combined with other classes in the video library that do not already contain inversions. Equipment: Mat, chair, 3-4 blankets, 3 blocks, belt. Focus: This class focuses on poses that will help to alleviate rounded shoulders, collapsed chest, kyphosis, and forward head. To varying degrees these are afflictions that are encountered by many people working for long periods of time at desks and computers. The poses in this class help to bring some traction to your shoulders, pulling them back and down. This helps to realign your shoulder blades and trapezius muscle, preventing them from lifting up and into your neck. Strengthening leg muscles that tend to become weakened by sitting in office chairs also helps to improve your ability to support and lift your spine against the effect of gravity. 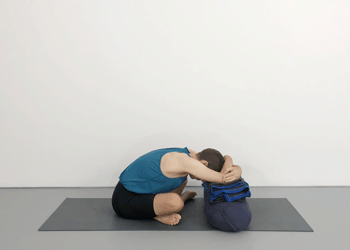 Although persistent practice will be necessary to bring about permanent improvement, many people who are troubled by a stiff upper back and shoulders will get instant respite from practicing a sequence of poses such as this one. Key Poses: Tadasana, utkatasana, parsvottanasana, salabhasana, chatushpadasana, purvottanasana. Equipment: Mat, chair, 2 blankets, 2 blocks, belt. Focus: This class brings together some of the main poses from the forward bending group, and places them in a sequence that can be completed in 40 minutes. The class complements the 90 minute Advanced Class 109, offering a selection of the same poses, including similar approaches and techniques, but in a much shorter format, with modifications given for students working with stiffer bodies. Key forward bends such as jana sirsasana, paschimottanasana, triang mukhaikapada paschimottanasna and upavista konasana are all included. The kneeling twist bharadvajasana is placed at the end of the sequence. The class will be ideal for students looking to improve hip and hamstrings mobility. Key Poses: Baddha konasana, janu sirsasana, upavista konasana, triang mukhaikapada paschimottanasana, paschimottanasan, bharadvajasana. Equipment: Mat, 2 blankets, 2 blocks, belt. Focus: This class features yoga poses that help to strengthen, stabilise and protect your knees. Many of the poses will help to strengthen the quadriceps generally and the vastus medialis specifically. This muscle is the innermost muscle located at the front thigh region near the kneecap. It is one of the group of four quadriceps muscles. It helps to stabilise your knee, and ensure a healthy tracking of your kneecap as your leg bends. The class includes several standing poses that are seen from the perspective of the knees. The movement of entering and exiting the poses are paused and held at specific intervals so as to help you isolate and activate this muscle. The class will be well suited to people who are working with knee difficulties, but also to anyone who is looking to optimise and protect the health of their knees. Key Poses: Utkatasana, trikonasana, virabhadrasana I & II, ardha chandrasana, parsvakonasana. Equipment: Mat, 2 blankets, 2 blocks. Focus: This class consists of a hip opening sequence for people with tight hips. Each pose is seen from the perspective of someone who might have restricted mobility in the hip region. Potential problems are anticipated, and a range of solutions are given that will help students find a well balanced and sustainable pose. The class includes poses that help to improve hip mobility, but also includes poses that are commonly problematic for stiff hips. Ways of safely modifying or adapting these poses are explored. Key Poses: Vrksasana, janu sirsasana, upavisa konasana, baddha konasana. Equipment: Mat, chair, bolster, 2 blankets, 2 belts. Focus: This is the next class in the Yoga for Athletes course. The sequence targets the main muscle groups and body regions that are involved in cycling. Poses that help to lengthen the quadriceps, hamstrings and calves form the nucleus of the practice. Cycling can also negatively impact smaller muscles around the toes and soles of the feet. Some less commonly practiced adaptations of yoga poses are also included to focus on these areas. Poses that help to release the hip flexors and gluteals also feature. Leaning forward on a bike for prolonged periods of time can commonly cause discomfort in the lower back. Hence some lower back extending poses are also featured. The class will suit both newer students, as well as more experienced practitioners. Key Poses: Virasana, utthita hasta padangusthasana, epa pada rajakapotasana, bhujangasana. Equipment: Mat, chair, 2 blankets, belt. Focus: This class focuses on yoga for office workers or people who spend long hours at desks and computers. Although a specific yoga chair is used in these images a standard office style chair can be used for each pose. The poses focus on combating rounding in the upper back, releasing tension from the shoulders and neck, creating space in the hands and wrists, removing aches and pains from the lower back, and helping to rejuvenate energy levels and decrease stress levels. The sequence can be completed within a short period of time. It can be practiced in office clothing if necessary and relies on no specific yoga equipment. 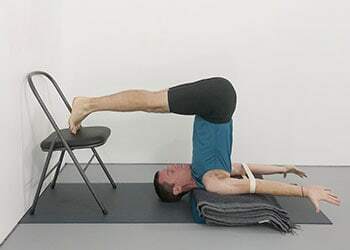 Key Poses: Parvatasana, garudasana, gomukhasana, purvottanasana, chair bharadvajasana. Focus: This weeks intermediate class on Yoga Selection explores ways of correctly aligning your pelvis In virabhadrasana III and related poses. For many people the pelvis tends to slant in this pose as soon the back leg rises. This tendency can overload the muscles in the lower back, and make the pose more prone to instability. In this video the hip alignment necessary for a balanced virabhadrasana III is first explored in variations of dog pose. This enables the hip action to be developed without the risk of losing your balance. From here the basic shape of virabhadrasana III is rotated around different positions including standing, reclining and upside down. This enables various arm, leg and whole body actions to be isolated and explored. The pose is unpacked and broken down into manageable key actions. These preparatory stages eventually prepare you for approaching the final pose without supports in the latter part of the class. Equipment: Mat, chair, blanket, 2 blocks. Focus: This class groups together a sequence of shoulder and arm related poses that will be helpful for swimmers. Although swimming uses a range of muscles located throughout the entire body, this particular class focuses on poses that help to improve shoulder mobility and arm reach. All the main upper body muscles that are involved in swimming such as the triceps, pectorals, deltoids and latissimus dorsi are targeted in this 30 minute video. It will benefit swimmers who are new to yoga, as well as more experienced practitioners who are looking to focus on their shoulders and arms. Both classical poses and therapeutic adaptations of poses are included in the class. Key Poses: Garudasana, gomukhasana, chair ustrasana, urdhva baddhanguliyasana. Equipment: Mat, chair, blanket, belt. Focus: This class focuses specifically on back releasing yoga poses. It has been released in tandem with an advanced backbend class. It can be used by more experienced students in addition to the advanced class, following on directly from the backbends as a way of releasing the spine and returning to a more neutral state. The class can also be used at any stage by people wanting to release a tight lower back. Although these poses are ideal for counterbalancing backbends they may also be beneficial for people experiencing stiffness or discomfort in the lower back. The class includes several variations of the reclining pose supta padangusthasana. Back releasing variations of uttanasana and pavana muktasana are also included. Key Poses: Uttanasana, supta padangusthasana, pavana muktasana. Equipment: Mat, chair, blanket, bolster, block. Focus: This weeks intermediate class focuses exclusively on twists. It includes standing twists, seated twists and chair twists. The class will be ideal for people wanting to concentrate on the general back releasing benefits of twists. It will also be beneficial for people wanting to brush up on the standing twist parivrtta parsvakonasana. This featured pose is broken down into stages that gradually build towards the final position. The video also includes most of the main seated twists such as bharadvajasana, ardha matsyendrasana and marichyasana III. The latter section of the class includes some supported chair twists. Key Poses: Parivrtta parsvakonasana, bharadvajasana, ardha matsyendrasana, marichyasana III. Focus: This class incorporates forward bends into a vinyasa style flowing sequence. It is an ideal sequence to be working with during the new year holiday period. Prop use is kept to a bare minimum making the class well suited to times when you are away from your regular home practice location. The pace of the class is dynamic, and the teaching instruction focuses on transition movements that encourage a sense of continuity, as opposed to detailed description of static positions. It is refreshing to explore forward bends in a faster paced class. Students with more restricted mobility may find that this approach helps to cut through stiffness. The class will be particularly helpful in terms of releasing tight gluteals. The leg action of eka pada rajakapotasana (pigeon pose) is repeatedly used as a transition pose that takes you from downward facing dog pose into the forward bends. This approach can help to bring a quality of lightness and energy to the forward bend group. Focus: This class concentrates exclusively on viloma pranayama. In viloma pranayama the movement of the breath is periodically paused in short and regular intervals. Rather than being continuous, the inhalation and exhalation progress in an alternating sequence of breath and breath retention.The class follows the first eight stages of viloma pranayama as described by B.K.S. Iyengar in his book "Light on Pranayama". The first three stages explore viloma pranaya from a reclining position. Eventually the pranayama is developed from a seated position. Viloma pranayama can help to cultivate mental clarity and focus, whilst helping to combat stress and anxiety. Key Poses: savasana, viloma pranayama. Equipment: Mat, bolster, 2 blankets. Focus: This week’s intermediate class features a dynamic vinyasa style Iyengar Yoga sequence. The class starts with an exploration of surya namaskar. Each of the poses contained in this famous sequence of movements are introduced initially in isolation, and are then progressively linked with their companion poses to form a flowing sequence. Eventually the movements of the body are closely synchronised with the movements of the breath. This approach to surya namaskar emphasises safety, builds confidence, and technical understanding. This style of class is both energising and strengthening. Eventually the class heads towards poses that help to build abdominal strength. Again, these poses are introduced initially as preparatory stages, and are then linked with dynamic movements that synchronise with the breath. Key Poses: surya namaskar, urdhva prasarita padasana. Focus: This class has originated out of multiple requests for a back care class that is suited to seniors. It adapts the basic movements of the other spine related classes that can be found in our three part yoga for back pain course, and makes them more accessible to people working with restricted movement and balance issues. The sequence includes poses and therapeutic adaptions that can help to improve the overall health of your spine. Some of the poses are intended to help prevent or fend off the onset of ailments, whilst others help to give relief to existing aches and pains. Yoga chairs are ideally suited to this type of yoga sequence. Although the images pictured here utilise a specific yoga chair, most homes will possess a domestic chair with similar proportions. Classes such as this demonstrate the Iyengar method’s adaptability in terms of bringing the benefits of yoga to a wide range of people and bodies. Key Poses: utthita hasta padangusthasana, trikonasana, supta padangusthasana. Focus: This weeks class works on improving shoulder mobility. Paschima namaskarasana (reverse prayer position) is the main focus of the class. The arm position is introduced initially in preparatory stages from a simple kneeling position. This is then developed with several variations of the standing pose parsvottanasana. More experienced students will comfortably be able to practice all of these variations, whilst newer students or anyone working with stiffer shoulders can consolidate the more basic actions. Eventually the namaskar action is introduced to the standing pose prasarita padottanasana. Key Poses: parsvottanasana, prasarita padottanasana, paschima namaskarasana. Equipment: Mat, blanket, 2 blocks, belt. Focus: This weeks intermediate class focuses on yoga for the spine. The class includes poses that can be included in an ongoing home yoga practice to help prevent injury and promote the overall health of your spine. Standing forward bends are included to help negate the strain that tight hamstrings can place on the back. Supported twisting movements from both standing and seated positions will help to improve your spinal range of movement. Some reclining poses are also included to release your back and help alleviate aches and pains. Focus: Here is the fourth and final class in our “Pune Cycle” course. The class consists of a gentle sequence of restorative chest opening poses, and finishes with some basic pranayama in both seated and reclining positions. The sequence includes classic Iyengar restorative poses such as supta baddha konasana, vaparita karani and setu bandha sarvangasana. These poses are included to calm your nervous system, relax your diaphragm region, and to help direct your attention to your breath. Supports are then used in savasana to keep your chest open whilst working with some reclining ujjayi pranayama. Eventually ujjayi inhalation and exhalation are practiced from an upright seated position. The class includes key principles of Iyengar Yoga restorative poses and basic pranayama. Focus: This class focuses on poses that give a gentle opening to the thoracic spine and shoulders. With people spending longer periods of time sitting at desks and working on computers, stiffness in these areas is becoming increasingly common in today’s world. It can potentially lead towards painful conditions associated with the neck and spine, and can negatively impact body posture habits and overall energy levels. The poses featured in this sequence will help to improve mobility and elasticity in the thoracic spine, encourage an increased range of motion for the shoulders and their related muscles, increase awareness of healthy posture habits, and help to release tension from the trapezius muscle and general shoulder region. The class begins with some matsyasana style variations where blocks support the upper back in a reclining simple cross leg position. The baddhanguliyasana arm position is then added to poses that start to simultaneously work the upper back and shoulders. Eventually a shoulder opening effect is gained from ustrasana and chatushpadasana. The video guides you in ways of ensuring that you are gently working into these areas without forcing. Alternatives and modifications are suggested for people working with more pronounced stiffness in the upper back and shoulders. Focus: This class presents forward bends and twists in a way that will be helpful for newer students and people working with stiffer bodies. Poses are modified, and supports are introduced where necessary, to help accomodate common issues such as tight hamstrings or weakness in the lower back. The class might also suit students who have completed the beginners section of the website and are starting to explore the intermediate classes. Most of the key, foundation forward bends are contained in the sequence. The teaching instruction emphasises fundamental Iyengar techniques. Key Poses: Baddha konasana, janu sirsasana, triang mukhaikapada paschimottanasana, pavista konasana. paschimottanasana, bharadvajasana. Focus: This class begins with some warming, upper body strengthening variations of adho mukha svanasana and sirsasana preparation. The standing pose parsvakonasana is then the main focus of the class. The asana is broken down into stages that progressively build towards the final position. Each stage is isolated and practiced as a pose in its own right. 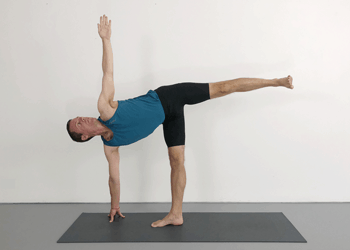 This allows the sequence to revolve around this key standing pose. Approaching the pose in this way helps to build a deeper understanding of this key Iyengar yoga standing pose. Focus: This class can be completed with a bare minimum of yoga props. For this reason it will be well suited to times when you may be travelling or away from your usual home practice base. It features a flowing sequence of poses that link abdominal strengthening movements with back releasing poses such as supta padangusthasana and jathara parivartanasana. In addition to this, dynamic standing poses are practiced with a surya namaskar style stepping that combines uttanasana with adho mukha svanasana. It can be helpful to practice without supports at times to ensure that your practice is not becoming reliant on props. Iyengar Yoga is often thought to be synonymous with prop use. The knowledge of when to use props can be enhanced by not using them and then observing the effect. This class will be beneficial if you are travelling and without your usual yoga accessories, but will also be helpful at any time when you are looking to keep prop use to a minimum. Focus: This class focuses on your shoulders and thoracic spine with standing and seated forward bends. 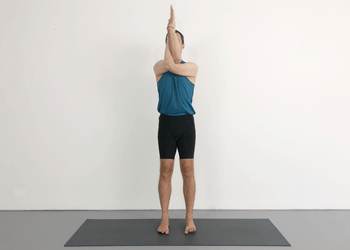 The gomukhasana arm action is introduced to the standing pose parsvottanasana. Prasarita podottanasana ii with arms in namaskar is also included. Both of the poses simultaneously improve shoulder mobility whilst containing the thoracic spine. This prepares the upper back for the seated poses that follow. Four key forward bends are then included in the sequence. Initially an upright twisting action is practiced, before entering the forward bend with an emphasis on preventing the thoracic spine from rounding. Eventually the kneeling twist bharadvajasana is included in the sequence. The class will be ideal for students who are working with stiffness around the shoulders and upper back. Modifications that help to accommodate restricted movement are included in the video. Focus: This class focuses on restorative yoga poses to help combat fatigue. It includes supported chest opening poses and inversions that help to calm the nervous system. All of the poses can be practiced without needing the use of a wall. This is helpful for individuals practicing in a home environment with limited space, and also for larger groups of students in studios with restricted wall space. This intermediate class shares some common poses with this weeks advanced class, and will be a helpful bridge in terms of making the transition between the two levels on the website. Some of the inversions included towards the end of this class will be ideal preparatory poses for the niralamba sarvangasana that is featured in this weeks advanced class. Focus: This 60 minute video explores restorative yoga poses and pranayama. The class includes classic Iyengar Yoga restorative poses such as supta baddha konasana, viparita karani and setu bandha sarvangasana. In this particular sequence they are used as poses to cultivate quietness and clarity prior to commencing pranayama. Both ujjayi and viloma pranayama are eventually practiced from both reclining and seated positions. This class is categorised as being intermediate, but will also suit more experienced practitioners who are looking to explore fundamental aspects of restorative yoga and pranayama. Focus: This weeks intermediate class looks at three different approaches to practicing urdhva dhanurasana. There are several methods that can be helpful when working with this pose. The effectiveness of these methods tends to vary from person to person. It is common for a technique to seem helpful for one individual, but unhelpful for another. For this reason it is good to experience a range of different methods. 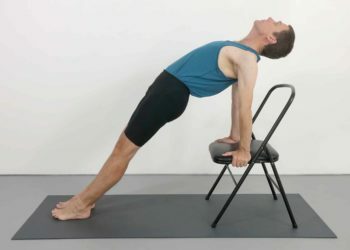 This class introduces the pose initially with the support of a chair. Priority is given to the key instructions of straightening your elbows and correctly positioning your shoulder blades. This is further developed in the second method where you lie over two bolsters and use blocks for your hands. Eventually the pose is practiced more independently with the assistance of slanted blocks. This third method again gives priority to straightening your arms, but progressively allows you to walk in closer with your feet to build height in the pose. Focus: This class focuses on forward bending basics and fundamentals. It includes the key poses janu sirsasana, paschimottanasana, triang mukhaikapada paschimottanasana and upavista konasana. Each pose is presented in a way that will suit students who are working with stiffer bodies. The video will also benefit more experienced students, and give them the opportunity to take things further. You are initially guided in how yoga props can help to create a stable foundation for each pose. The core principles of forward bending are then explored with your spine in a more upright position. Eventually the full forward bends are explored without placing strain on the spine. Key Poses: Janu sirsasana, paschimottanasana, triang mukhaikapada, upavista konasana. Focus: This class condenses eight essential Iyengar yoga standing poses into a 30 minute duration sequence. It will be ideally suited to periods when you are wanting to continue your practice, amidst a busy schedule. Keeping your practice simple during these times can be helpful in terms of maintaining momentum. Regular but short practice sessions may be more beneficial than complicated sequences that demand extra time. Standing poses such as the ones included in this class, are ideal poses to concentrate on when you have a limited amount of time in which to practice. They help to combat stress, boost energy and maintain strength and flexibility. Focus: This video focuses on therapeutic yoga poses for the shoulders, wrists and neck. In the early part of the class different variations of the baddhanguliyasana arm action help you to work on your shoulders and wrists simultaneously. Some variations of adho mukha svanasana then start to more directly target your wrists. The majority of poses in the sequence will help to improve shoulder mobility. An array of asanas are chosen to approach the shoulders from all of their potential movement ranges. In the latter part of the class these shoulder related poses help to release and relax the trapezius, and muscles related to the neck. 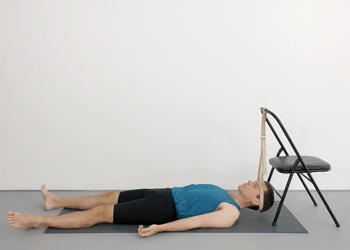 The class ends with a version of savasana where the neck is given a gentle traction by suspending the head in a looped belt that passes around the back of the skull. Focus: This weeks intermediate class includes a range of restorative chest opening poses. The class is completed within a 30 minute period and will be an ideal boost during times of low energy. The sequence can easily fit into a busy schedule and helps you to prioritise health and wellbeing during stressful times. Iyengar Yoga restorative poses such as upaashrayi upavista konasana, setu bandha sarvangasana and a supported version of purvottanasana are included in the class. Focus:This class is an ideal introduction to chair backbends. It will help newer students to get started, and more experienced students to consolidate the basics of this important group of poses. Chair backbends are best approached once some initial experience with “baby” backbends has been achieved. Familiarity with poses such as salabhsana, dhanurasana, ustrasana and urdhva mukha svanasana is recommended. This class begins with a preparatory chest opening pose where you lie over blocks. A similar opening to your chest and upper back is achieved in a version of chatushpadasana where your feet are raised up onto a chair. From there you start to lie back over a chair, initially with two blocks supporting your neck. Progressively you then learn to straighten your legs whilst extending your arms over your head. Eventually, you explore a pose that helps to build towards dwi pada viparita dandasana. The chair backbends presented in this class will also be ideal for times when you are working with lower energy, or times when you are looking to preserve energy. Focus: Standing poses can leave you feeling energised, but are not always well suited to times when you are feeling tired or low in energy. They are not poses that naturally help to preserve energy. This class adapts a full sequence of standing poses so they can be more easily practiced during times of lower energy. 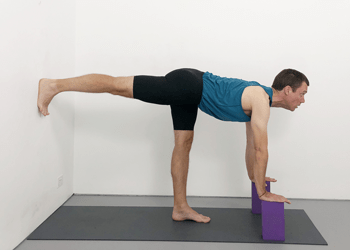 A wall is used as a support in each of the standing poses to help improve balance and reduce muscular effort. This approach to practicing standing poses can also be therapeutic when practicing during hot summer days, or when recovering from illness. Key Poses: trikonasana, virabhadrasana II, parsvakonasana, ardha chandrasana, parivrtta trikonasana, parivrtta ardha chandrasana, parsvottanasana, virabhadrasana I, prasarita padottanasana. Equipment: Mat, blanket, 2 blocks. Focus: This weeks intermediate class will help to improve your parivrtta trikonasana. The tutorial style class is based entirely around this standing twist. The sequence covers all aspects of the pose. Initial variations in the first part of the class isolate key aspects of the pose. The foundation for the twisting action is established in your legs and pelvis before being developed into the upper torso. From there you use the wall to support the front, and then the back of your body. This helps you to explore the twisting aspect of the pose without needing to focus on balance. Eventually a reclining version of supta padangusthana helps to improve flexibility in muscle groups that can otherwise obstruct your access to parivrtta trikonasana. Focus: This class brings together a sequence of chest opening poses that will help to raise energy and lift your mood. It will help combat feelings of lethargy and depression. The class begins with some chest opening shoulder variations that naturally encourage a deeper and more energetic inhalation. The poses that follow are linked together to form a dynamic sequence. Standing poses are adapted so as to maximise their potential to lift and open the upper part of your chest. Eventually the poses halasana and paschimottanasana are combined in a dynamic back and forth rolling action that cuts through stiffness and brings a feeling of lightness to the whole body. Focus: This weeks intermediate class looks exclusively at sirsasana. It includes an array of preparatory poses that can be beneficial if you are new to this pose and looking to establish a foundation, or more experienced with sirsasana and looking for some strengthening supplementary poses. The action of kicking up is practiced initially without your head being in contact with the floor. This ensures that your neck is protected whilst the technique is being learnt. From there a block is used to isolate and support the region of the upper back that is most inclined to collapse in sirsasana. Eventually your head is brought lightly to the floor but still with the support of a block. From there the action of rotating your outer upper arms is explored with a block placed between your hands, this maintains lift in your shoulders and ensures that your neck will avoid compression. The technique of interlocking your fingers and placing your hands behind your head is then explored in a kneeling position before commencing with the full inversion. Finally the full pose is attempted with the support of a wall. Techniques from the previous variations are then incorporated into sirsasana. This class will benefit students who are transitioning from the beginner section of the website into the weekly Intermediate classes. More experienced students will also benefit from this tutorial on such a fundamental yoga pose. The short length of the video allows it to be easily practiced in addition to other classes. Focus: This class consolidates the essential techniques of seated twists. After some initial preparatory poses the class heads straight to twists. Basic principles are initially explored in a simple cross leg twisting position. Care is taken here to lift the spine before adding the twisting aspect of the pose. From there you head to the kneeling twist bharadvajasana where your hips are consciously held level. In marichyasana III you are able to deepen the twist by utilising your arm strength. Eventually a version of ardha matsyendrasana helps you to release your back whilst penetrating still further into the twisting action. Focus: Pranayama is the focus of this weeks intermediate class. Restorative poses such as supta baddha konasana and setu bandha sarvangasana are used at the beginning of the class to prepare for pranayama. These poses help to open your chest and make you more aware of your breath. Ujjayi and viloma pranayama are then explored from a reclining position. The class then heads towards seated pranayama. A chair is used initially for this purpose. Sitting in the chair helps to lift your spine without creating tension and hardness in the diaphragm region. The jalandhara bandha chin lock can then be introduced without your chest dropping. Eventually these techniques are used in a simple cross leg posture. 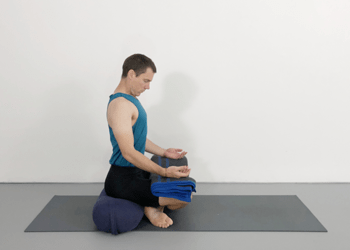 Ujjayi and viloma pranayama are then practiced using this seated position. The class will help to confirm the fundamentals of pranayama practice and restorative yoga. Focus: Vinyasa commonly refers to sequences of yoga poses that are linked with continuous flowing movement. They will often be based around surya namaskar (sun salutations) with an emphasis on adho mukha svanasana, chaturanga dandasana and urdhva mukha svanasana. Vinyasa sequences will often synchronise the movements of the body with the movements of the breath. This approach to practice is easily incorporated into the constantly changing sequences of Iyengar Yoga. Practitioners might choose to practice in this way for a variety of different reasons. Vinyasa sequences are generally dynamic in nature. They help to cultivate strength and stimulate energy. They could be helpful for combating depression, or easing the impact of cold weather, or bringing improved range of movement to stiff joints and muscles. For some people the process of linking breath and movement can help to reduce stress, or ease anxiety. This particular vinyasa sequence links the flowing surya namaskar movements with standing poses and backbends. 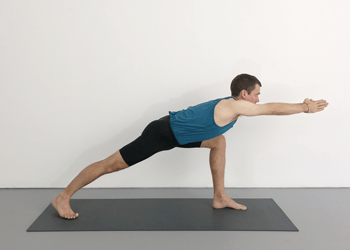 It is both energising and strengthening, and will help to cut through the stiffness that many people encounter with a more static approach to these poses. Focus: Forward bends can be difficult poses for people working with tight hamstrings. To accomodate this stiffness, this group of poses will often need to be modified with props and supports. This can mean that students with stiffer bodies will need to approach forward bends differently to students with more flexible bodies. This class presents forward bends from the perspective of someone with tight hamstrings. It pre-empts some of the difficulties that might be encountered, and includes methods and techniques for making forward bends more accessible and beneficial. Key forward bends such as paschimottanasana, janu sirsasana, triang mukhaikapada paschimottanasana and upavista konasana are all included. Focus: The focus of this weeks intermediate class are the standing poses ardha chandrasana and parsvottanasana. Each asana is methodically broken down into stages where key aspects of the pose can be learnt in isolation. Eventually theses stages are recombined to result in an improved final position. Ardha chandrasana is practiced initially with a focus on the standing leg, then then raised leg, and eventually the top arm. Finally all of these aspects are synchronised into the one continuous movement. In parsvottanasana the namaskar arm action is introduced initially with your arms clasped behind your back. This is then developed to the baddha hastasana action with your arms folded behind your back, before eventually adding namaskar. Focus: Abdominal strengthening poses are the sole focus of this 25 minute tutorial style class. All the key abdominal poses such as paripurna navasana and ardha navasana are included, as well as urdhva prasarita padasana. Improving your abdominal strength can be beneficial for your spine and overall posture. It can also help to make other poses such as sarvangasana (shoulderstand) and halasana (plough pose) easier to access. With dedicated practice, improvements can be noticed in a relatively short period of time. Focus: This weeks class puts some of the main Iyengar Yoga restorative poses into a sequence that is completed within 45 minutes. It contains classic chest opening poses like setu bandha sarvangasana, and rejuvenating inversions such as viparita karani. Breath awareness is featured in an upright cross leg position, and then a chest opening version of savasana completes the class. The class also covers the basics of prop use in restorative yoga. The time duration of the class is long enough to bring about change in terms of reducing stress levels, but short enough to fit into a busy schedule. It will suit newer students as well as more experienced practitioners. 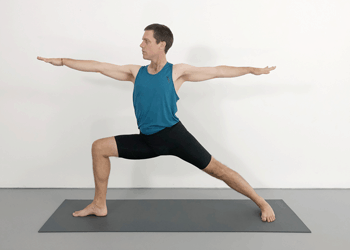 Focus: This tutorial style class concentrates solely on the standing pose virabhadrasana III. Different versions and adaptations of the pose are explored in ways that help to highlight and explain fundamental techniques. The pose is practiced initially from the perspective of downward facing dog pose and handstand. From there the pose is explored with the hands, and then back foot supported by a wall. Eventually the full pose is developed away from the wall in free balance. This video is a great opportunity to consolidate and improve your understanding of this challenging standing pose. Focus: This class has been made in response to a number of requests from people wanting a sequence of yoga poses that will benefit runners. It targets each of the main muscle groups that tend to be affected by running and jogging. The class starts with poses that help to release and lengthen your hamstrings. It them systematically works through calf lengthening poses, poses for the adductor/groin region, poses for the psoas and quadriceps, the gluteals, and the iliotibial band. Some poses that help to release your lower back are also included at the end of the class. This sequence will be well suited to athletes and joggers, or anyone wanting to systematically stretch the main muscle groups associated with running. Focus: This is the last in our series of classes combining inversions with the main groups of yoga poses. In this class inversions are built into a sequence that also contains some of the more commonly practiced restorative poses. Techniques from the preceding classes are developed to the point where all of the inversions are practiced in their final stage. The class guides you in how to practice sirsasana (headstand), adho mukha vrksasana (handstand) and sarvangasana (shoulderstand). In addition to these inversions, the sequence also includes chest opening restorative poses. These calming poses can help to combat stress. Their rejuvenating qualities can be beneficial when your energy levels are depleted. They are also helpful for improving awareness of how you breathe. Focus: This class helps you to integrate inversions with a backbend sequence. The early section of the class concentrates on handstand and headstand. Initially the preparatory versions of the poses are practiced, and then you are guided through ways of approaching the full poses. The strengthening effects of the preparatory inversions will continue to be beneficial beyond the point where you are able to confidently practice the final positions. The backbend component of the class will be ideal for intermediate students who are looking to expand their understanding of basic backbend techniques. The sequence includes most of the "baby backbends" and also an introductory look at chair backbends. Focus: This class continues our focus on building inversions into your home practice. In this sequence inversions are added to forward bends and twists. Initially adho mukha vrksasana (handstand) and sirsasana (headstand) are practiced in their preparatory stages. Eventually the action of kicking up into the fully inverted final position is introduced. This starts as a simple hopping action and in time leads to being able to confidently kick upside down. The sequence then includes poses that reinforce the fundamental techniques of forward bends and twists. Both standing and seated poses are included in this section. Sarvangasana (shoulderstand) is the focus of the last section of the class. You are shown in detail how to use props to assist with this pose. Improve your inversions and consolidate your forward bends and twists with this class. Focus: This class will help you to confidently integrate inversions with other poses in your yoga practice. It combines a sequence of standing poses with sirsasana (headstand), adho mukha vrksasana (handstand) and sarvangasana (shoulderstand). Each of the inversions are initially presented in a preparatory form, and then developed with options that are closer to the final pose. The class will be ideally suited to people making the transition from the Beginners section to the Weekly Intermediate Classes. The inverted poses supplement a full sequence of standing poses including most of the key asanas from the intermediate level. Key Poses: Sirsasana preparation, adho mukha vrksasana preparation, halasana, standing poses. Focus: This class integrates the strengthening pose chaturanga dandasana with standing poses and sun salutes. The sequence is dynamic and flowing. Initially chaturanga dandasana is broken down into accessible preparatory stages. Two supported versions of the asana are then included. Finally the pose is practiced independently, and linked with the surya namaskar cycle. The sun salutes begin with a slower paced stepping action before eventually increasing in tempo and including several standing poses. Expect this class to be energising and strengthening. Focus: This weeks class contains poses that help to combat stress. The sequence focusses on restorative yoga poses that promote relaxation and breath awareness. Poses to soften, and open your hips and groins, are combined with reclining chest opening poses. The sequence as a whole has a rejuvenating, energy preserving emphasis. 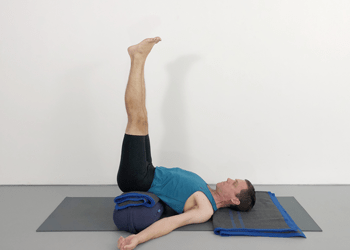 Many of the fundamental restorative Iyengar poses such as viparita karani and setu bandha sarvangasana are taught with step by step instructions. This class is appropriate for intermediate students, but will also suit students who regularly work from the advanced section. Focus: This class will be ideal for students who are newer to backbends. Fundamental techniques and concepts are introduced and explored through a range of poses. At the beginning of the class you will work with standing poses that help to contain your upper back, and open your chest, without adding stress to your lower back. Several preparatory backbends are then introduced that will help to strengthen the muscles that run alongside your spine. The strengthening benefit of these poses is emphasised with multiple repetitions held for shorter time durations. The class culminates with a look at the kneeling backbend ustrasana. This class will help to consolidate a basic understanding of backbends. It will also help to build strength and elasticity in your spine, arms and legs. From a traditional yoga perspective, backbends are thought to stimulate physical and mental energy levels. They are often popular among yoga practitioners for this reason. Focus: This weeks class guides you through a series of forward bends and twists. The class begins with some standing forwards bends that help to bring some elasticity to your muscles, and prepare you for the seated poses that follow. In this section of the class you are working dynamically, stepping in our out of the poses from dog pose. The seated forward bend section of the sequence introduces krounchasana. Although often considered a more advanced forward bend, the pose is treated here in a way that will suit people with limited flexibility. The class then continues towards a comprehensive section on seated twists. Overall this will be a great class to help improve hamstring flexibility, and build momentum with spine releasing twists. Focus: This class focusses on yoga poses that help to strengthen, and bring flexibility to the muscles associated with your knees. Many of the poses in the sequence will help to strengthen your quadriceps muscle group generally, but your Vastus Medialis specifically. This muscle sits just above and to the inside of your kneecap, and is fundamental to the proper functioning of your knee. Techniques are also given to help maintain space within your knee joints in kneeling positions; and how to avoid stress being placed on your knees in standing poses. The class will be ideal for anyone needing to take particular care of their knees, or anyone interested in optimising the general health of their knees. Focus: Many of the poses from this class will overlap with poses from the Weekly Advanced Class 58, but will be be targeted to people who may have stiffer bodies, and less familiarity with inversions. The class will also be more specifically targeted towards poses that help to release tight gluteals and hip flexors. Poses are modified where necessary to ensure that anyone with restriction in these areas can still participate. Even more advanced poses such as hanumanasana (monkey pose/splits) are adapted so that less experienced, or less flexible students can still receive their hip opening benefits. Releasing tight glutes and hip flexors can help to keep your spine healthy, improve your overall posture, and fast-track your yoga progress. Focus: This class offers a comprehensive review of headstand (sirsasana) and shoulderstand (sarvangasana). These fundamental poses form the nucleus of an Iyengar yoga home practice. In addition to the full classical poses, both asanas are broken down into preparatory stages that will strengthen and build understanding. This class will be ideal for anyone who is new to the Yoga Selection Weekly Intermediate Classes. The poses are taught methodically, and links are made with the work from the Beginner Extension Courses I and II. All of the basic techniques of both poses are consolidated and explored in detail. The class will be of interest to newer students, but will also help more experienced students who are looking to revise key points, and improve technique. Although beneficial as a stand alone class, this video will also be a great addition to some of the other intermediate classes that do not already contain inversions. Focus: This class focusses exclusively on seated twists. In many of our other videos this group of poses are included alongside poses such as forward bends or abdominals. This class gives you an opportunity to practice twists as stand alone poses. You will be guided through seated twists such as bharadvajasana and marichyasana III, as well as more specifically therapeutic chair twists. Twists have traditionally been thought of as cleansing poses. They are also great poses for releasing your back, and helping to improve the overall health of your spine. Focus: This weeks Intermediate Class adapts basic forward bends to assist people working with stiff bodies. Forward bends are often problematic for anyone practicing with restrictions in their knees, hips, leg muscles and back. This class uses props in ways that make these poses safe and accessible. Learn how to incorporate a chair into your forward bends to bypass hamstring stiffness. Feel the more energetic quality that can come when your spine is given more support, and your chest is kept more open. Focus: This weeks intermediate class gives you a burst of energetic backbends within half an hour. The sequence will help to strengthen your legs, open your chest and boost your energy levels. Before starting the backbend component of the class the standing pose virabhadrasana I is linked with a flowing, surya namaskar style action. From there you head towards upward facing dog pose, salabhasana and then chatushpadasana. These preparatory backbends are great when you have ample time and are heading towards a longer session of deeper backbends; but they are also potent poses to focus on when you are making the most of a limited practice time. Focus: This weeks intermediate class focusses urdhva dhanurasana (bridge pose). It looks at different methods for working with this fundamental backbend. There are many reasons why people struggle to independently lift up into this pose. It may be because of restricted mobility in your shoulders or upper back. It may be a lack of strength; or lack of confidence; or it may be that you haven't yet found the right approach to suit your particular body. This class will help you to explore techniques for safely approaching urdhva dhanurasana. Equipment: Mat, chair, bolster, 2 blocks, belt. Focus: There are numerous ways in which Iyengar Yoga can help to reduce lower back pain. Although there are many causes for lower back pain, it is very common for people to arrive at yoga classes with this pain originating at least in part from tight hamstrings. Stiffness in the group of 3 muscles at the back of your thighs known collectively as the hamstrings can restrict the movement of your pelvis in relation to the movement of your legs. As a result of this restriction, undue strain can be placed upon your lumbar spine. A practical example of this is when you sit on the floor and straighten your legs to the front (dandasana). In this position tight hamstrings can tend to pull the back of the pelvis downwards thus reducing the curvature of the lumbar spine. This can then put the spine in a more vulnerable position as you attempt to sit upright. You simultaneously feel the tension of the spine being pulled downwards and lifted upwards at the same time. Knowing that the spine can benefit from improved hamstring mobility can create a dilemma for many people. Positions that allow the hamstrings to stretch will often simultaneously challenge the lower back, potentially aggravating existing discomfort. 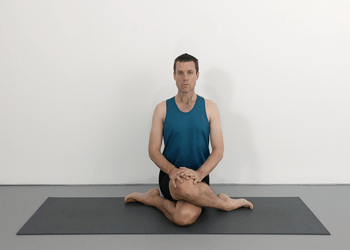 With this in mind the following sequence looks to present a number of poses that can help you to safely improve the flexibility of your hamstrings in positions where your spine is comfortably supported. 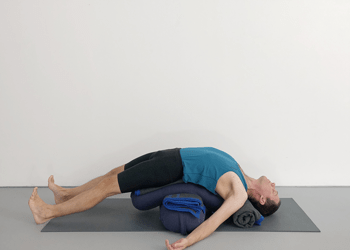 Poses that help to release tension from the lower back, and poses that help to improve the range of movement in the lower back are also included. Focus: This class takes an active approach towards forward bends. Priority is given to maintaining a straight spine and open chest. Each pose is initially explored in an upright position, ensuring that your spine is correctly supported by your legs. Twisting movements are then added to these upright positions helping to bring an elastic quality to your spine. Eventually you are guided in how to safely bend forwards without putting strain on your back. Prior to forward bends, the class starts with some strengthening poses that help to build your progression towards headstand, handstand and forearm balance. This class will be well suited to students who are newer to forward bends; or students working with stiffer bodies; or anyone looking to consolidate the essential techniques of forward bends. Focus: Standing poses are great for when your practice time is limited. This class will be ideal for when you only have a 30 minute window in which to practice. Within that time it will help to build strength, flexibility and energy. It will also help to maintain the ongoing momentum of your practice. For many people the cumulative effect of regular shorter yoga sessions will be more beneficial than isolated longer ones. This sequence gets straight into standing poses. You are guided through six asanas which highlight various aspects of strength, stability, balance and mobility. The class will also be well suited to anyone wishing to brush up on standing pose basis. It can be combined with other videos from the library if you are wanting to extend your practice time. Focus: This class consists of just three poses. Supta baddha konasana, setu bandha sarvangasana and viparita karani are all key poses in the Iyengar Yoga restorative repertoire. Each one will help to calm your nervous system, combat stress and promote relaxation. Although it is great to include these poses in longer sequences, extra time is not always easy to find during busy periods in your life. For this reason a short, 25 minute class such as this one might be the best fit. The set up for each of these restorative poses is relatively simple and accessible for home practitioners. The video guides you through each pose in detail, allowing you the space to relax and breathe. Focus: This class will be perfect if you are wanting to consolidate the basics of backbends. It will be helpful if you are newer to this group of poses and looking to learn the foundations. It will also work well for more experienced students who are wanting to fit some energetic, chest opening poses into a 35 minute practice window. All the basic techniques of backbends are explored within urdhva mukha svanasana, salabhasana and chatush padasana. Chest opening standing poses are used at the start of the class to prepare you for the backbends that follow. Focus: Chair twists are great poses to help improve your spine mobility and back health. This shorter, tutorial style class focusses exclusively on chair twists. Initially these twists are adapted from classical standing poses. The use of the chair in these particular poses helps to improve your balance, whilst giving you more leverage to twist, and more incremental control as to how far your twist. Eventually you use the chair for seated twists. Several versions of bharadvajasana are included. In addition to twisting your spine some of these seated twists will also help to improve mobility in your shoulders. 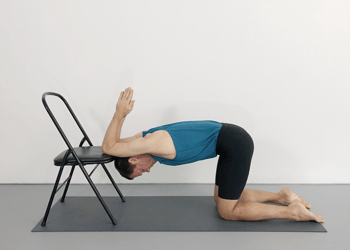 Chair twists can be great for releasing tension from your back, but also your whole body. Focus: This class is an opportunity to focus on sirsasana (headstand) and adho mukha vrksasana (handstand). These two famous inversions are presented in both their preparatory stages, and final positions. In handstand you begin with a half version of the pose. It helps you to gain strength, confidence and familiarity with being upside down. Eventually you work with the action of kicking into the full inversion. You then explore the techniques of the final pose. Headstand is presented in a similar way. Preparatory stages that build strength and technical understanding are undertaken first. You then learn ways of using props to support your neck when you begin coming closer to the full inversion. Eventually you are guided through the techniques of the final position. Focus: Practicing sun salutes can be an opportunity to condense a wider variety of yoga poses into a shorter session time. This class has you moving more energetically through a 30 minute sequence. During this time you will link surya namaskar with standing poses. In this particular class the teaching instruction will focus less on technique and more on how to transition from pose to pose. From standing poses you will then head towards abdominals. This class will be both energising and strengthening. 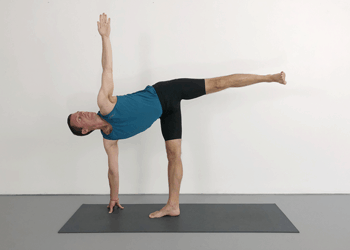 Focus: This class highlights the standing pose ardha chandrasana (half moon pose). The pose is explored with three different approaches. You are initially guided in the more traditional method of coming into the pose via trikonasana. From there a method of more directly stepping into the pose is highlighted. Eventually you look at the more challenging approach of using parsvakonasana to arrive in the pose. Rather than holding poses for a long time, most of the poses in this sequence are treated dynamically. Poses are often repeated several times on the one side with shorter timings. Your breath is consciously linked to the action of coming in and out of poses. In addition to the work on ardha chandrasana, you are also guided through other standing poses. Some gentle shoulder opening poses are also included in this all-round class. Focus: Although categorised as intermediate, this class is also suitable for people who are brand new to yoga. The class focusses on basic yoga poses that help to promote the health of your lower back. 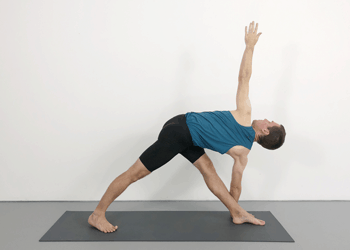 Some gentle shoulder opening poses are also included in the sequence. The poses should be accessible to most people regardless of age or physical condition. They are designed to gently stretch your hamstrings, strengthen your legs, improve your hip and shoulder flexibility, and assist in relieving lower back discomfort. The all-round nature of the class will mean that it will be an ideal one to regularly repeat. Although specific yoga props are used in this video, they can easily be replaced with common household items such as stools, blankets, towels, belts, boxes, etc. Focus: Backbends are great poses for raising energy levels. It is common to feel energised after completing a session of backbends. However, it is also common to feel challenged by these poses in the present moment of practice. They can be demanding poses in terms of how your legs and arms need to work. You may feel instability and fatigue at times when muscular strength is necessary. This class modifies four basic backbends so that you are more able to use your arms to energetically lift your bodyweight. You are guided in ways of generating better lift from your arms up and into your chest. When your arms lift your chest lifts. When your chest lifts you may find that the energising effect of the backbends also lifts. Focus: Standing forward bends are often used in sequences to prepare your body for the seated forward bends that will follow. In addition to this important role, standing forward bends are also great to work with as poses in their own right. This class groups together several standing forward bends and incorporates them into a sequence that also focusses on knee care. Many of the teaching points will culminate in urdhva prasarita eka padasana, the standing forward bend where one leg is raised off the floor. You are guided in how to use a wall to help with balance and control in this potentially precarious pose. All the poses will help you to acquire the flexibility necessary for progressing towards more advanced seated forward bends. This will be a particularly useful class for anyone wanting to improve their hamstring flexibility. Focus: This class helps you to improve your leg muscle flexibility and abdominal strength. The first part of this 30 minute class concentrates on standing leg stretches that target your hamstrings, adductors and groins. Utthita hasta padangusthasana and ardha chandrasana are practiced along with their twisting variations. From there the class heads in the direction of abdominal strengthening poses. Paripurna navasana and pavana muktasana are both included. They are taught in stages that will assist anyone with less experience. Urdhva prasarita padasans is also taught in stages where you learn to use your abdominal strength to lower and raise your legs from a reclining position. Key Poses: Utthita hasta padangusthasana, ardha chandrasana, paripurna navasana, urdhva prasarita padasana. Focus: The focus of this 30 minute class is relaxation. All of the poses included here will help to relieve stress and soothe your nervous system. It will be well suited to times when you are feeling lower in energy and needing to rejuvenate. The class could be used before bedtime to assist with getting a good nights sleep. It could also be used or to help combat illness, or aid recovery. It could also be helpful at any time when you are looking to slow down and reduce stress levels. Focus: This class covers similar territory to its companion advanced class but is targeted towards people who are still building their experience with backbends. The 30 minute sequence does not include any inversions. Only basic equipment is used throughout the class. Backbend techniques are initially explored in standing positions where you are instructed in how to use you legs to support your spine. Your focus will be on opening your chest without contracting your lower back. Once into the backbend section of the class you will practice moving from downward facing dog pose to upward facing dog pose. Eventually camel pose is practiced with techniques that will allow you to methodically come deeper into the pose at your own pace. Focus: Forward bends can initially be more challenging from a seated position. It is common to encounter more resistance in the muscles associated with the legs, hips and spine when sitting on the floor. This 30 minute tutorial style class shows you how to approach forward bends from standing positions. Poses are chosen based on their ability to improve flexibility in muscle groups that are used in forward bends. Expect that this class will help to lengthen hamstrings and adductors. You will be guided in how to stretch these leg muscles whilst maintaining a supported spine. Focus: Developing a home yoga practice is all about momentum. Regular shorter sessions may help you to build this momentum. This class is ideal in this respect. It is the third in a series of 30 minute standing pose sequences that easily fit into a busy schedule. Standing poses are great for maintaining an all-round yoga capacity. Practiced regularly, they help to remove stiffness from hamstrings and other leg muscles. Having stronger and more flexible legs can be great for your spine and posture. Expect that this class will help to build your overall strength and energy. Try rotating this class with the other classes in the "express standing" series. They are all simple and convenient classes that will not need a lot of extra equipment. Focus: This class combines poses from three of the main asana groups. It will help to build a balanced momentum in your practice. The sequence covers similar poses and techniques to its companion Advanced Class 32, but is targeted towards students who are less familiar with inversions and backbends. The starting point for this video is standing poses. You learn how to create stability in specific parts of the body whilst bringing movement to adjacent areas. This approach is then developed with forward bends. Back releasing twists comprise the latter part of the practice. Expect that this class will help to simultaneously improve multiple areas of your practice. Focus: This class begins with some basic hip opening poses. It then progresses to poses that help to bring mobility and strength to your wrists. Poses such as visvamitrasana and eka hasta bhujasana are great for wrists but also help to improve your overall body strength. Eventually the class heads in the direction of abdominal strengthening poses. This sequence covers a diverse range of poses and body regions. It will be well suited to anyone wanting to focus on poses that target the wrists, but will also be beneficial in terms of improving strength generally. Focus: Even once you are regularly practicing a full headstand, it is still beneficial to return to the preparatory versions of the pose. This video includes a variety of poses that build strength and technical understanding of this important yoga pose. It will be beneficial if you are newer to the pose and wanting to build a foundation. Equally, if you are more experienced, you might use this class to concentrate on poses that will strengthen your arms and upper body. From headstand you are then guided through the reclining leg stretches supta padangusthasana. The main focus of this class is however inversions. The latter part of the class concentrates on shoulderstand done with the support of a chair. This variation of the pose helps you to access its more cooling and calming qualities. Focus: Improve your backbends, inversions and standing poses simultaneously. This energising class links together several different groups of poses. The sequence starts with some strengthening variations of headstand and handstand. From there you work quickly through some standing poses, stepping in and out of each pose from dog pose. Backbends feature in the last section of the class. Here you focus on urdhva mukha svanasana (up dog) and ustrasana (camel pose). Both of these poses are practiced with and without supports. Finally urdhva dhanurasana is practiced in the latter part of the class. In order to fully utilise the upper part of your back this pose is taught initially reclining over the frame of a chair. Expect that this class will be energising and strengthening. Focus: This class shows how a chair can be used to help support your upper back, and keep your chest open whilst doing forward bends and twists. Whereas sometimes a support is used in these poses to bring about a restorative quality, here the chair is used more actively. The frame of the chair provides an excellent structure for your hands to grip in order to apply a corrective adjustment to the spine and upper torso. This approach to forward bends will be particularly beneficial to anyone working with a stiffer body. The class begins using the chair to assist with standing forward bend and standing twists. Twisting actions are then emphasised throughout the forward bends. These actions are then linked with seated twists in the latter part of the class. Focus: The 50 minute duration of this class allows sufficient time to work through a full sequence of standing poses, whilst also building momentum with inversions. Most of the standing poses from the intermediate level are included in this sequence. In trikonasana you will look at ways of creating space for your neck. In parsvakonasana the focus is more on your waist, and in virabhadrasana II attention is directed to your shoulders. In parivrtta trikonasana you seperate the regions of the pose that need to move from the parts that need to be still. One of defining features of Iyengar Yoga is the way in which it can continually renew its approach to familiar poses. This class continues the ongoing process of learning standing poses with a sustained inquiry. A deeper understanding is gained gradually over time as new insights reveal themselves layer by layer. Focus: This is the second in a series of classes that focus exclusively on yoga poses that help to improve the health of your shoulders. At only 35 minutes in duration, this class easily fits into a busy schedule. You can choose to practice it by itself in isolation, or use it to supplement other classes. It might be that you work with this class as part of rehabilitation from an injury; or because your shoulders are particularly stiff; or because you are just wanting to give this region of the body a more in-depth exploration. Most of the poses in this sequence have been adapted in order to emphasise their therapeutic benefits. A working knowledge of classical yoga poses will be beneficial but not essential. Repeated and regular practice of this class will maximise its potential benefits. Focus: Pranayama translates from Sanskrit as "extension of the breath". It is used as a term to describe the aspect of yoga concerned with breathing, and breath control. This class focusses on the basics of pranayama. You commence working with your breath in some preparatory chest opening poses. Once basic breath observation has been established, you eventually progress towards ujjayi pranayama, where you consciously deepen your inhalation, and then exhalation. From ujjayi you then move to viloma pranayama, where you pause the flow of the breath in intervals during inhalation and exhalation. These pranayamas are taught initially in a reclining position where you open your chest whilst keeping your body relaxed. In the latter part of the class you progress to practicing pranayama in a seated position. This class will be well suited to early morning practice, or any time that you are looking to relax and revive energy levels. Focus: This class explores chair backbends in detail. Most of the commonly used variations are included. Clear instruction is given in terms of how to use props to safely set up these poses. 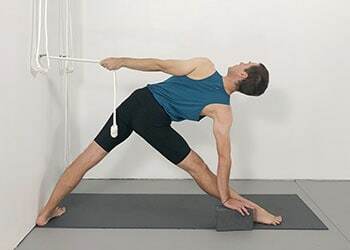 Techniques are shared that help to maximise the benefits that can be gained from practicing this group of poses. 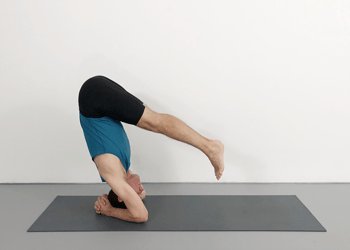 The sequence heads in the direction of urdhva dhanurasana (bridge pose). The class culminates in a version of this pose done with the support of a chair. You are guided in how to use the chair to open your upper back and shoulders. These techniques will be helpful when you next approach the pose more actively without the assistance of a chair. The methods explained in this class will help you to receive the uplifting effect of backbends with a minimum of energy expenditure. For this reason the sequence will suit anyone wanting to deepen their understanding of backbends, whilst also being a great class for anyone who might be feeling lower in energy. Focus: It is often a misconception that being good at forward bends means being able to bend like a hinge. With experience comes the knowledge of how to balance a pose. Knowing how far to come forwards whilst keeping your chest open and spine straight; keeping your pelvis anchored as your spine moves forwards; and evenly extending the right and left sides of the body. With this in mind it is common for students with stiff bodies to gain an increasingly thorough understanding of forward bends. This class will be a good reminder of how to approach forward bends if you are working with restriction in your body. As you work through the main forward bends you will be concentrating on techniques that help to accomodate stiffness. This is a great opportunity to explore how foundation principles can lead towards a more advanced yoga practice. Focus: This class is categorised as intermediate but will also suit experienced students. It contains most of the standing poses from this level and lets you consolidate them within a 45 minute practice. The class features the three twisting standing poses; parivrrta trikonasana, parivrtta ardha chandrasana and parivrtta parsvakonasana. For newer students this section of the class will be an ideal introduction to these poses, whilst for more experienced students it will be a good opportunity to consolidate and penetrate deeper. Throughout the class you will be focussing on classic Iyengar techniques that assist with balance, weight distribution and chest opening. Standing poses are fundamental to a healthy practice. They are best learnt gradually, layer by layer, over a sustained period of time. Focus: Tight hamstrings and adductors can make many yoga poses significantly harder to perform. The hamstrings are the group of muscles at the back of the thighs. The adductors are a group of muscles located in the inner thigh region. Stretching these muscles can be uncomfortable or even painful. Because of this many people tend to avoid poses that challenge these areas. Improving flexibility in these muscle groups can help to remove strain from your spine, improve the mobility of your hips, and optimise the functioning of your knee joints. This class focusses entirely on yoga poses that improve flexibility in the hamstrings and adductors. You are guided through a variety of standing and reclining positions where you are able to comprehensively stretch these muscles with control and support. Focus: Surya Namaskar (sun salutes) have traditionally been associated with early morning practice. This stimulating sequence of movements are great for raising energy levels. They can help to shake off lethargy, build strength, improve blood circulation, and bring mobility to muscles and joints. This class starts with the basic surya namaskar movements at a slowed down pace. You are guided in how to modify the positions if you are working with limited flexibility. Once familiar with the basic movements you are able to flow through the stages more dynamically. Standing poses are eventually incorporated into the surya namaskar sequence. This class will be well suited to early morning practice, or anytime when you are looking for an energy boost. Focus: Handstand, forearm balance, headstand and shoulderstand are the sole focus of this class. These four poses are fundamental inversions at this level. Being familiar with them will assist you in eventually making the transition to the weekly advanced classes. Each inversion is broken down into preparatory stages which give you a clear method for eventually attaining the full pose. It will be beneficial to regularly come back and repeat this class. At only 30 minutes in duration it can easily be added to another class from the library. This class will help to strengthen and improve mobility in your wrists and shoulders. It will help to build overall body strength and awareness.These poses are naturally energising and confidence building. Focus: This tutorial style class focusses exclusively on the famous yoga pose Salamba Sirsasana (headstand). It will benefit students who are new to the pose and looking to learn the basic principles, as well as more experienced students looking to deepen their understanding. The class guides you through a systematic approach to headstand. You begin working with poses that help to strengthen your upper body. This ensures that you are able to support your body weight with your arms without risking compression in your neck. Initially headstand is learnt with the head off the floor. Eventually you start to work in the pose with the top of your head placed on the floor. Numerous techniques are taught in this class that will assist you to become proficient at this important yoga pose. Focus: Making sure that your legs are working correctly is one of the most beneficial things that you can do for your backbends. Collectively, the backbends are demanding poses for the legs. Without the leg muscles being properly engaged, you run the risk of putting unnecessary strain on your spine. Ideally after a session of backbends it will be your legs that will feel tired and not your lower back. This class looks at various methods of teaching the legs to work correctly. You will be guided in the basic positioning of the feet, and then explore how they work whilst in a backbend. From there you move up to the correct positioning of your knees, and then eventually the upper leg. You will use props at various stages to isolate key actions of all the various leg muscles involved in backbends. This energetic class will help to strengthen your legs, improve the health of your back, and deepen your understanding of backbends. Focus: The ability to keep an open chest whilst in a forward bend is hugely beneficial. It helps to give more of an energetic lift to your practice. It also helps to alleviate potential strain on the spine by minimising the degree of arching in the back. This class works with practical methods for keeping the chest open in forward bends. Standing forward bends are worked with initially, enabling you to utilise leg strength to lengthen the front of the spine, and contain the back of the spine. From there you progress to seated poses where fundamental forward bend techniques are explored. Eventually you make use of a chair to actively get the chest as open as possible. This approach will also enable you to improve mobility in your shoulders. Focus: Virabhadrasana III (warrior pose III) is for many people the more difficult of the three warrior poses. Not only is a degree of flexibility needed to find the basic shape of the pose, but also mental concentration is required to stay and hold. Added to this is the reality check of either balancing or not. This class looks at three approaches to getting into Virabhadrasana III. Initially you work with a simplified version of the pose where you can concentrate on weight transfer rather than lifting the body weight upwards. From there you progressively head towards the more classical approach of passing through the first warrior pose. Like the other warrior poses, Virabhdrasana III is empowering and uplifting. This class also includes other key standing poses from the intermediate level. You are able to go deeper with warrior III whilst improving general strength, flexibility and general understanding. Focus: This tutorial style class brings together an array of yoga poses that help to improve mobility in the shoulders. The 35 minute class is long enough to be able to penetrate and bring about change, but short enough for you to be able to squeeze into your schedule. If you are wanting to focus on this area and make some improvements then this class will be a great one to regularly practice. It can also be combined with other classes from the library. All the basic shoulder opening poses are worked with in detail here. Classical yoga poses are combined with adapted poses that highlight specific therapeutic benefits. In addition to increasing mobility you will work with movements that strengthen and stabilise. Focus: In this class you will be working with restorative poses aimed at relieving stress and calming the breath. The sequence contains some standing poses and forward bends that have been adapted so as to reduce muscular effort. It then heads in the direction of chest opening poses that help to bring freedom to the diaphragm. This is an ideal sequence for improving breath awareness and preparing the body and mind for Pranayama. All of the poses in this class will contribute to the creation of softness and space in the lower abdomen. For this reason the class will be well suited to women during menstruation. In Iyengar Yoga it is very common for this type of practice to be adopted during this time. The class will also be perfect for both men and women during times of stress, low energy or illness. Focus: If you are newer to yoga and working mainly from the beginner section then this class will be a great way for you to try out the new release weekly classes. Equally, if you are more experienced then this class will be perfect for building momentum in your home practice. The poses in this sequence will help to improve overall strength and maintain flexibility. The class brings together some key standing poses from the beginners section, and adds some abdominal strengthening poses. It ends with some reclining leg stretching poses. This type of all-round sequence is great if you are looking to introduce an extra class to your weekly yoga schedule. Within 50 minutes you will have covered multiple areas of the body. This has a real potential for rapidly improving your overall yoga practice. This class will be beneficial for all levels of yoga experience. Thanks for your interest in this. These older classes have been removed from the site a while ago. As we have added to and improved the content and made updates we have chosen to remove some of the earlier videos.